Summer is here and that means one thing... movies... lots of them! It is very easy when one puts together a list like this to try and go broad. This is all well and good but sometimes we end up going a mile long and an inch deep, only to make it difficult for certain moviegoers to find the films specific to them. And while it's easy to throw a list together we decided to go a different direction and target kids with this current offering of movies. As much as we think of younger people when we think about summer, it's hard not to feel like, with all the movies coming out, kids can sometimes be forgotten. With young people having tablets, phones and other things with screens thrust at them from a very young age, it is easy to think that any form of content can be a virtual baby-sitter. The reality is that this isn't the case and our young friends want good content just like everybody else. Quite simply, being discerning doesn't really have an age after one is a year or two old. Now, some people might wonder about some of the movies on this list. For example, they may question whether a movie like Avengers: Infinity War is really a kids film? This is a valid question. However, the fact that the movies are dealing with superheroes and done with layers upon layers of CGI only seems to blur the line between live action and cartoon. Also, there are some films on this list that have already come out. The list I have compiled does go back to April. Now, before you start crying foul please understand that most of the already released films on this list will play for a long time. Yes, somewhere over the summer, in a second run theater of some merit, you will be able to watch Show Dogs. It's just the way the release cycle works. So parents we hope that you enjoy our complete summer movie list for kids. We tried to be as comprehensive as possible while also giving young people a variety of content to chose from. This list contains action, adventure, comedy, thrills, chills and just about everything else you might expect from any other summer movie list! Avengers: Infinity War, for a lot of people, has come and gone. However this monolith of a film is filled with a ton of action, adventure and downright surprises. This tale of the Avengers trying to stop Thanos from grabbing all the Infinity Stones is the stuff of Marvel legend. There is a solid balance between action, dialogue and all around Marvel zaniness and fun. At the same time, Avengers: Infinity War that might just get kids thinking about the big issues that are at the forefront of this film. Chances are they will want to re-watch the other Marvel films that they have already seen. Heck, they might even break out the graphic novels which means, you guessed it, more summer reading! What makes so much present day anime appeal to so many different audiences is the way they mix the present day with the fantastical. Lu Over the Wall follows a middle school student named Kai who finds that everything is a bummer. However, their world is upended in the best of all ways when they meet a mermaid named Lu. Suddenly, Kai comes to realize the true meaning of friendship and also that life isn't so bad after all. Aside from the fact that middle school is an amazing place to set a coming of age story, Lu Over the Wall is a gloriously fantastical tale that plays strongly to the idea that differences should never get in the way of true friendship. What better kids summer movie lesson could there be? Throw in the whole musical element to this story and this is a film you need to see somehow... someway! At first glass you'll probably think that Show Dogs is simply Miss Congeniality with animals. You are right and not so right. Show Dogs follows a Rottweiler named Max. He's a police dog who likes to keep things simple. He wants to have an easy life and all of that is taken from him when he has to go undercover in a dog show. He is aided in this by Frank (Will Arnett), his human partner, who always appears to be one step behind his canine friend. As you can guess Show Dogs is filled with hi-jinks, laughs, and moments where you might think that our animal friends might really be in trouble. As is usually the case, none of that bad stuff happens, and it is us humans that end up the foils. Sure, the whole talking animal thing kinda looks silly but in a movie called Show Dogs should it really be any other way? Alright, don't listen to the people sounding the death knell for the Star Wars franchise. Solo: A Star Wars Story is an action filled adventure that, while maybe not totally necessary in the Star Wars universe, still manages to tell a great story. This tale of a young Han Solo (Alden Ehrenreich) scamming his way across the galaxy is a sight to behold. That he eventually hooks up with Chewbacca and Lando Calrissian (Donald Glover) only shakes up his world further. Han Solo is an opportunist of the highest order and what he is able to achieve here is nothing short of legendary. He eventually finds himself doing a major deal with Dryden Vos (Paul Bettany), only to discover that this deal is ill-fated and actually puts him in the crosshairs of one of Star Wars most infamous baddies. Kids will love it. Parents might be a bit more discerning but this film might not be for you anyway. Mister Rogers. You say that name and it evokes many thoughts and feelings. Won't You Be My Neighbor is an exploration of the life of Fred Rogers. It examines his show, Mister Rogers' Neighborhood which used simple sets, simple life lessons, and the warm host at the heart of the show to influence millions and millions of people. That it ran for 31 seasons and is the precursor to such shows as Blues Clues, Mister Rogers' Neighborhood is a true example of substance over style. Sure, this is a documentary and it might not appeal to all kids. However, our kids watch documentaries all the time on YouTube. They just don't realize it because it is usually an unboxing or gaming video that they have an interest in. Take a chance on Won't You Be My Neighbor. It will most likely invoke interest in the original show which is filled with life lessons for kids and adults. In a role reversal that seems to mirror our modern times, Incredibles 2 sees Mr. Incredible having to look after Jack-Jack as his wife Elastigirl is out saving the world. Sure, there's a lot more going on here than just that plot line, otherwise why involve such other characters such as Frozone, Frozone;s Wife, Dash and others? Factor in that Bob Odenkirk is playing a smarmy character named Wilson Deavor, and that just adds to the Incredibles 2 anticipation level. Making this even more exciting is the fact that The Incredibles original director, Brad Bird, is back at the helm for this sequel. Bird brings a real sure hand to these films, and that makes for films that are fun, whimsical, and contain very important messages. 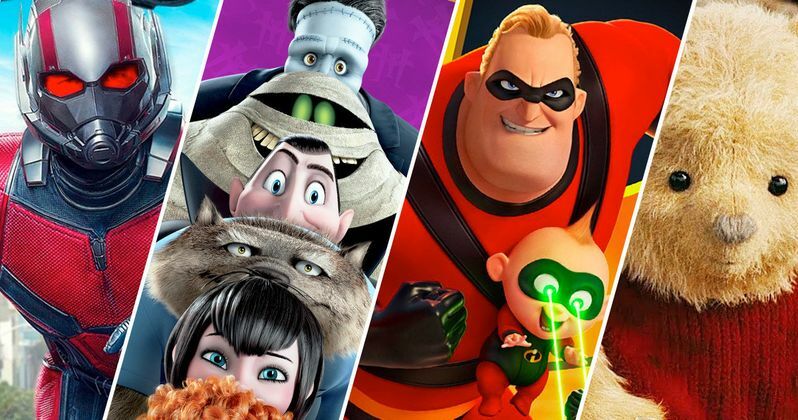 Whether you love animation or are just lukewarm to it, you can't deny that Incredibles 2 looks like maybe the best time at the movies this summer! Extinction is the order of the day in Jurassic World: Fallen Kingdom. In this highly regarded summer sequel, Owen (Chris Pratt) and Claire (Bryce Dallas Howard) do everything in the power to save the dinosaurs from extinction when an old volcano starts spitting out lava again. Considering what the world bore witness to when Hawaii's big island experienced the same thing, the pre-historic tale of Jurassic World: Fallen Kingdom finds itself, oddly enough, being more timely than it ever imagined. With thrills, chills, and the best special effects that money can buy, Jurassic World: Fallen Kingdom has a rabid fan base that has been patiently waiting for this movie to stomp into theaters. Based on the previews it doesn't seem like it is going to disappoint. If the kitschy cool of this film doesn't grab kids the way it most likely will adults, Ant-Man and the Wasp can at least boast outstanding effects and lots of fun dialogue from Paul Rudd (aka Ant-Man). This one sees Scott Lang aka Ant-Man aka Paul Rudd as he juggles his duties as a crime fighter AND being a doting dad. His life gets uber complicated when Dr. Pym (Michael Douglas) presents him with another urgent matter to attend to. Aiding him is The Wasp (Evangeline Lilly) and, as you can guess, Ant-Man is in dire need of her abilities. Ant-Man and the Wasp has a lot going for it. Not the least of it will be its ability to appeal to adults AND kids. On top of that, Paul Rudd is imminently likable, Evangeline Lilly is superbly cast, and the supporting cast (Douglas, Michael Pena, Michelle Pfeiffer, Walton Goggins, etc. ), all bring something unique to the table. This kids film is truly the best of both worlds! There are some animated franchises like Despicable Me that can kind a get a little stale. In the case of Hotel Transylvania 3: Summer Vacation that is not something we need to worry about. In this new installment, Mavis (the voice of Selena Gomez) sets her dad, Dracula (voiced by Adam Sandler), up with a relaxing cruise. This is all well and good until Dracula falls in love with Ericka (voiced by Kathryn Hahn), only to find out that Ericka's last name is Van Helsing. Alright, this idea would be clever on it's own. To set it aboard a ship, and flip the script so that the Hotel Transylvania series sees Dracula taking a siesta, is nothing short of genius. We live in very odd times. It is nice to see that certain things remain stable. Hotel Transylvania 3: Summer Vacation represents the best kind of stability. It will make us laugh, think and engage in a healthy discourse about how we perceive one another. Win-win! Well, Warner Bros. needs a boost in their superhero franchises and it looks like Teen Titans Go! To the Movies could be it. This story sees the characters of Superman, Wonder Woman, Cyborg, Batman, Robin, etc. as teenagers aspiring to make it big on the silver screen. Sadly, their plans get upended when a crazy, super-villain tries to take over earth. At this point our faithful heroes must choose between art and humanity. With a voice cast that includes the likes of Kristen Bell, Jimmy Kimmel, Will Arnett, and Nicolas Cage (finally, sort of, playing Superman! ), how can you not be excited about this summer film?!? The always good Ewan McGregor plays the title character in this delectable treat from Disney. Christopher Robin is now an adult who has settled into the hum-drum, banal and tedious activities of raising a family. Then his old friend Winnie the Pooh comes back into his life and Robin must return to the Hundred Acre Wood from his past and help Pooh search for his friends. Then, Pooh and friends decide they need to help him. With a strong message for kids as well as adults, Christopher Robin is the kind of film that should really pack them in at the box office. Mixing live action with with animation, viewers should really enjoy seeing Robin return to his past in order to find himself in the present. At a time when nostalgia for the 1980s is rampant in this country, it is truly grand getting to see Christopher Robin's creations dealing with him in the real world. Christopher Robin is a movie in 2018 that is necessary. A teenager who isn't doing very much has his world bitten when he comes into contact with an electronic dog. In A-X-L we get a dog that is electric, weaponized, and wanted by the military. Over the course of the film we come to see that even though the dog is essentially a piece of fighting equipment, it is able to evolve into something wholly real. And the relationship between the electronic pup and his new owner Miles (Alex Neustaedter) is a genuine one. Also, add to this that the always good Thomas Jane lends his acting chops to A-X-L, and you have the potential sleeper hit of the kids summer movie season. Afterall, what child hasn't dreamed of owning an electric pet? And given the proliferation of technology in just about everything we own today, is a future with animals like A-X-L roaming the streets really that far off? I think not!